Ok, so firstly I apologise for the lack of post action yesterday but forgive me as this is a double today. This doesn’t mean that I totally failed on the Janathon front, just that my Virgin connection was having a little trouble and I had no time to sort it out. I made a little pact to myself on 1st January that Janathon exercise can only be counted as exercise if I change into my workout clothes to commence. So even if I trotted 5k to the shops and back and didn’t break a sweat, this wouldn’t count on my logging and blogging. I had a day off work yesterday but I had to get up early to finish something I didn’t get time to finish on Thursday. This meant I had a rubbish night’s sleep and woke on the hour every hour in a panic that I was going to sleep in. I got it done and then headed to get my hair done. Natalie Elias at the TIGI academy is officially amazing and made me the happiest girl yesterday so thank you chica. Getting your hair done is the best feeling. Fact! 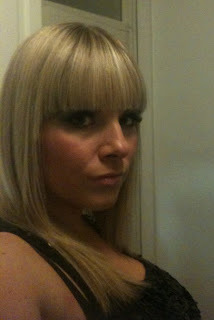 Roots banished and blunt fringe back = a good day. Then I headed off to the Park Plaza, Victoria to meet my friend for a bit of Spa action and a much needed massage. I naturally took my costume and planned to do a few lengths in the pool to clock up the day's Janathon exercise. Plan scuppered when I discovered a lack of pool and even more annoyingly there was a gym yet I had no gym kit.I didn't think it was entirely appropriate to prance around in my functional yet very unattractive swimsuit. I ended up doing a few core-strength exercises in a sauna the size of my wardrobe. So after a fairly short time I gave up and opted for some chilled out book reading instead until my appointment time. My massage was amazing though and I will do a separate post on this tomorrow. I had to head straight home after the massage to get scrubbed up for my brother’s engagement party so no time for exercise. I indulged in several alcoholic beverages last night for the first time this year but I had a great time. 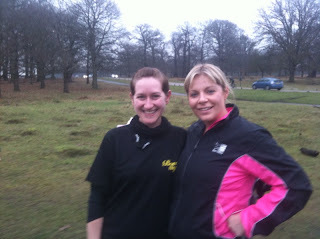 However, I had agreed to meet @gemmakgraham at Parkrun this morning. Hmmm! When I got home last night I was adamant that I wasn’t crashing out of Janathon in this way, especially after somebody in real life telling me I was her inspiration. ( Hello Amy. Sweet dreams if you’re about to head to bed!) Ok, she was joking but it highlighted that people are actually reading my posts and following what I am doing. The pressure is most definitely on. While Jon prepared a random feast of food I resorted to some rug action exercise in my PJ’s. Don’t be fooled that because I wasn’t in my gym kit I wasn’t going to put any effort in. Wrong! I beasted myself repeating some of the drills that we did at the Nike class and it hurt. The plan was to do a very quick log and an even quicker blog. Virgin had other ideas, hence no post. A rubbish excuse on a pretty poor effort day in comparison to most of the others I have blogged about I know. This morning I was tired, miserable and my body was hurting. I was planning to meet Gemma (a fellow Team Bangs girly) at the start of the run. Part of me really did want to go to see if I could knock off 2 minutes as I pledged a couple of weeks ago but the bigger portion of me wanted to stay in bed. I even texted Gemma in a cowardly attempt to cop out and said I was happy to go running later if she wasn’t up for running around a hilly, muddy park in the freezing cold. Before she had a chance to reply I had a word with myself and did a big loud shouty growl and decided I was going to do this and do it properly. I pulled on my gear and as I ventured out into the cold Gemma replied to say she was on her way. Let’s do this Team Bangs! It really hurt today. My shins and calf hurt and my body ached but I was determined to improve my time. I picked out a runner and I stuck with her the whole way. Halfway round I started to doubt myself. My legs were heavy and my breathing was awful! I was dehydrated (yes, bad alcohol!) and the constant water sipping wasn’t helping me to set a steady pace with my breathing. Particular low points of the run were being caned by a 10 year old whippersnapper and an old man that was bandaged up like a mummy. High points were that I managed to stick with my chosen target. Another massive high point when I was struggling fiercely was Gemma’s smiley face and encouraging little wave. As we neared the end of the run I was determined I wanted to overtake my nominated target. Let me just get this straight. Parkrun is a friendly social run and isn’t competitive but it always helps me to set mini targets and unbeknown to this lady she wasn mine today. I pushed myself and managed to just pull past her with about 100 uphill metres to go but could I keep up the lead? It’s a bit rubbish to make the effort to overtake somebody for all of 2 seconds to then be letf for dust at the finish. She came back behind me and despite my loud garage track banging in my ears, I could hear her breathing heavily very close behind me. She was fighting back! It seemed I was now her target. I pushed hard with everything that I had to the point that I thought there was a serious vomit risk. All of the speedy runners that had finished were having smug chats at the finish line but there were lots on the line supporting us through to the bitter end. Being handed that position token is the best feeling. Actually, I correct that. Even better, is getting your email with your time. 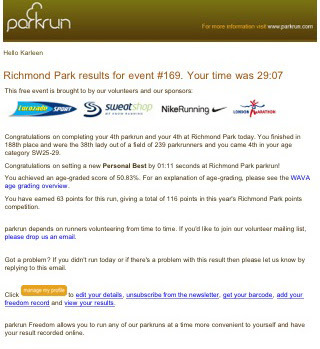 Here is my email following today’s run. Whoop whoop! Well done girlies! That's fantastic! Thanks Bangs! Good weekend for #TeamBangsonthe Run. 6 weeks until Paris.